Spencer Devon Brewing held a fun event this week to support the MANARC Thrift Store and Veterans Moving Forward. Proceeds from the event will help support these two organizations which provide support and assistance to veterans in the Fredericksburg area. One of the highlights of the evening was the launch of the Spencer Devon Mug Club. Attendees were entered into a drawing for a chance to win one of only 30 custom mugs created by D.D. Lecky at Liberty Town Pottery, and membership in the limited mug club. Those lucky enough to be selected made a donation to MANARC to join the club. The mug entitles the owner to 20 ounce fills for the 16 ounce price, as well as discounts on food and invitations to future special events. Colleen and I attended the event and held our two tickets in anticipation as we enjoyed a long dinner and a couple of new Spencer Devon beers. During the drawing, the ticket Colleen held was called, and she generously gave me her winning ticket. We held our breaths for the other ticket to be drawn, but we weren't that lucky. Since we generally visit Spencer Devon together, I am sure she'll enjoy some beer from the beautiful mug as well. As mentioned, the brewery also had two new beers on tap that we hadn't tried before. The first, Ellerslie Harvest Ale is Spencer Devon's first fresh-hopped beer. The Chinook and Cascade hops were grown at Ellerslie Hop Farm in King George County. The low ABV ale had a pleasing bready malt base with a mild hop bitterness. The fresh hops added a bit of green "zing" to the finish. 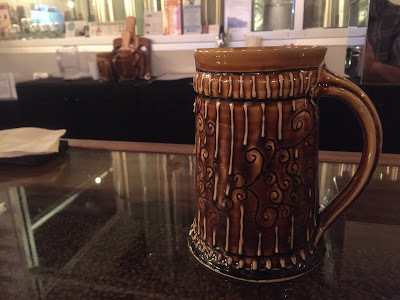 It was very easy-drinking and I enjoyed a couple of pints, including a mug full in the new "Mug Club" mug. I'll be sure to look for the Harvest Ale again. The other new beer available that evening was Center House Association Ale. The beer was brewed for the Marine Corps' Center House Association. It's available at the brewery for a limited time, but will be brewed specially for the Officer's Mess at the Marine Barracks at 8th and I in Washington. Norway Spruce boughs were used in brewing the Mild Ale, which is based on an old recipe. The beer has notes of caramel malt with a low hop bitterness. I was unable to detect the presence of the spruce, though Colleen felt she could pick up some pine-like notes in the aroma. Like the Harvest Ale, this was also a mild, and seemingly low ABV beer. Live music, a worthy cause, and good food and beer made for a fun evening. We were lucky to snag a couple of seats at the bar before crowd really picked up, as the brewpub was packed for the evening. I look forward to returning to Spencer Devon soon and enjoying more great beer, in the new mug of course.